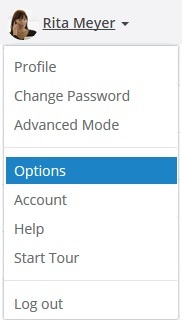 To access the settings, click on your name in the Top Bar. Here you can go to your Profile, to upload a profile picture, Change your Password, change into Advanced Mode, access Options, your Account, and the Help-documentaion, start the demo Tour, or Log out. PLEASE NOTE: You can only access Options and Account if you have administrator permissions for the InLoox Web App account you are working in. If you have created the account, you are automatically given adiminstrator permissions. Settings | InLoox 10 Web App • Copyright 1999-2019 © InLoox, Inc. All rights reserved.